This month marked a historic event for Texas. An impressive crowd of 117,429 people experienced a significant inaugural event. On November 18, 2012 the opening of the Circuit of the Americas took place with the running of the 1st Annual United States Grand Prix. The total attendance for the weekend festivities totaled 265,499. The sport of Formula 1™ racing dates back to WWII when the plans for a Formula One driver’s championship were discussed but held off due to the onset of war. It took until 1950, when in May of that year the first world championship race was held at Silverstone, the home of British motorsport. Non-championship races took place throughout the world until about 1983 when they were deemed unprofitable. For the first time since 2007, Formula 1 racing has returned in Austin, Texas with an all new venue––The Circuit of the Americas (CoTA). This $400 million sports and entertainment venue, completed only days before the event, entered the record books as the first track built for the purpose of racing Formula 1 in the country and host to its own Grand Prix. Vodafone McLaren Mercedes’ Lewis Hamilton claimed his fourth Grand Prix of the season and his second United States Grand Prix victory in five years at the CoTA. McLaren was awarded the constructor’s trophy for Austin’s inaugural event as well. 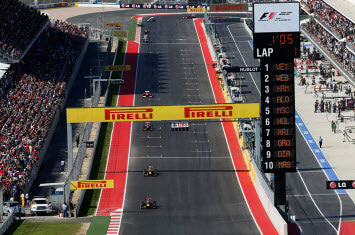 Design is crucial in the construction of such a venue where the turns of the CoTA have been compared to some of the most well known tracks throughout the world. The Grand Prix circuit is located in Wandering Creek, southeast of the Texan capital, and was designed by Hermann Tilke in collaboration with American architectural firm HKS. The natural topography was taken advantage of in the design of the 20-turn anticlockwise track. Elevation changes of up to 40 meters helped to create the expected signature corner at Turn One. A steep uphill run coming into the turn has created quite an impressive start to the remaining turns throughout the circuit. Seating capacity of 120,000 was created with grandstands, semi-permanent stands and natural seating areas. This 900 acre site will not only include the Grand Prix circuit but will also host support buildings, conference and banquet areas and an outdoor music space. This impressive venue has put Austin, Texas on the map in the world of auto racing. The growth of the economic environment in the Austin business community has already seen a positive upswing. A recent blog post from our Boxpert Blog expands on the economic impact of the opening of the CoTA and its projected economic impact for the future. It is with great pride that we expand on a little history, background and specifics of this world-class neighbor of ours. And we again congratulate the entire organization at the Circuit of the Americas on their successful inaugural opening race. Hurricane Sandy produced devastation across the Northeast on October 29th, 2012 leaving thousands of living and work structures damaged or completely ruined. Families, local businesses and even state offices were impacted by the largest hurricane measured in diameter on record to hit the United States. In the aftermath of this natural disaster, the rebuilding and reconstruction of neighborhoods, towns, homes, buildings and businesses has begun. During this expected multiple-year phase of rebuilding, the need for temporary structures is widespread. Over the years, natural disasters across the globe have left similar communities in a state of rebuilding. As the rebuilding and disaster relief efforts continue, we would like to take some time here to discuss the use of repurposed shipping containers as a viable option for disaster relief. One community in Breezy Point, NJ suffered a fire due to an explosion during the Hurricane leveling 111 private homes. Only the stone foundations were left in the aftermath. Not one single structure in this community was left without significant damage. This community is home to many New York police officers and fire fighters, many of whom served in 9/11 where 37 of their own residents perished. While Breezy Point is only one such community in the midst of a storm covering an area of devastation the size of Europe, let’s take this community as an example of what can be a foundation location for the possibility of a repurposed shipping container solution. Residential homes, police posts and small businesses populate this neighborhood community––each with its own structure and purpose. Temporary living structures, mobile offices and clinics can be constructed with the use of a modified repurposed shipping container. Starting with a base structure of either a 20’ or 40’ foot container is the beginning of the modification process. These wind and water tight structures are made of 16 gauge vertically corrugated steel. Structural integrity is inherent in the design and is the ideal base structure for the beginning stage of any disaster relief structure. With the addition of electrical hookups, insulation, personnel doors and windows, repurposed shipping containers could be transformed easily into a viable living solution. Drywall and paint and even the addition of bathroom facilities can assist in making this steel structure a disaster relief temporary home. The contents of some homes and businesses may not have been completely destroyed during our most recent US natural disaster. The storage of those contents is crucial in preserving what belongings and merchandise may have survived. Conex boxes provide a stable, dry,safe and mobile environment for the contents that survived the natural disaster. Mobile offices functioning in a variety of capacities can be transformed from a repurposed shipping container. Similar to the living space described above, electrical hookups with Internet and phone can be added to the finished interior of the shipping container. Interior lighting and personal doors create the foundation of adding any furniture, office equipment or clinic supplies for this functional workspace. At Falcon Containers, our heart goes out to the families and individuals directly affected by Hurricane Sandy. It is during these times of natural disaster that our nation comes together to support the rebuilding process and to assist individuals in recreating their homes and businesses. Our Austin, Texas headquartered facility and our Norfolk fabrication location is the home base for our modification process. As the rebuilding and disaster relief efforts continue, Falcon Containers stands ready to assist communities across the devastation area to recover. Please refer to our most recent blog post for more information on the use of repurposed shipping containers in disaster relief efforts: Falcon Containers Boxpert Blog.